Q: If elected, what is your highest priority for improving education in Hawai‘i? Maile: Cooling schools off! So many schools on the Wai`anae Coast and throughout the state lack air conditioning and other cooling mechanisms. The classrooms, portables, and other buildings are miserably hot, and make learning practically unbearable. I am encouraged by the DOE’s recent move to install photo-voltaic panels at Wai`anae Elementary. So far, I have obtained power upgrades/air conditioning for Wai`anae High, Wai`anae Intermediate, and Kamaile Academy, and also held a fan drive which put some fans in all the schools in my district. I will continue to make this a top priority. Q: Do you support evaluation, tenure, and compensation for teachers and principals linked to student improvement? Q: If elected, what is your highest priority for improving jobs and the economy in Hawai‘i? Maile: Continuing to make higher education a top priority. My proudest achievement this past session was obtaining $3m to help Leeward Community College-Wai`anae purchase their own building and expand. I also supported UH West O`ahu’s efforts to obtain $48m by being part of a “hui” of legislators who requested these funds. Making higher education more accessible for those in rural communities like Wai`anae will go a long way toward addressing our high teacher turnover, lack of medical professionals, lack of social workers, lack of entrepeneurialism, etc. on this Coast. Stopping the “brain drain” will help our economy overall. Q: Which industries should we be investing in for Hawai‘i’s future? Maile: Alternative energy. Hawai`i has the unique environment and natural resources to make us the ideal place for technologies like geothermal, ocean thermal, and wave/solar/wind energy, etc. We should encourage the development of these alternative energies so that we can power not only ourselves, but export energy and bring in revenue to our state. Q: If elected, what is your highest priority for strengthening local food production in Hawai‘i? 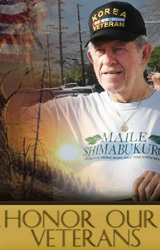 Maile: We should provide more state lands to local farmers, like we have done with dairy farmers on Hawai`i island. We should go back to requiring businesses who sell in Hawai`i to buy local, e.g., Meadow Gold’s “Island Fresh” milk should trully be from Hawai`i, and not the mainland the way it is now. We should legalize traditional poi preparation, eg, provide DOH licenses to those who prepare poi by hand (right now DOH will not approve of this). We should continue to fund DLNR’s Legacy Lands fund and the City’s Clean Water and Natural Lands fund. We should require the military to go back to allowing neighborhing farmers to use their “buffer zone” lands for cattle grazing. We should restore natural stream flows. Q: Do you support stronger measures to keep prime agricultural lands in agriculture? Q: If elected, what is your highest priority for addressing energy and climate change? 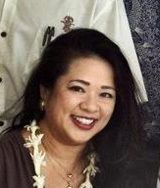 Maile: Same response as a few questions above: Hawai`i has the unique environment and natural resources to make us the ideal place for technologies like geothermal, ocean thermal, and wave/solar/wind energy, etc. We should encourage the development of these alternative energies so that we can power not only ourselves, but export energy and bring in revenue to our state. Q: Do you support the continuation of the State solar investment tax credits, including the refundable credits which allow low-income people to participate? Q: If elected, what is your highest priority for addressing poverty and homelessness in Hawai‘i? Maile: We need pet-friendly homeless shelters. Many of the homeless are on the beach because pets are not allowed in the shelters/rentals. Many of them need their pets for emotional comfort/therapeutic reasons. There are numerous organizations who provide “animal rescue” services to the homeless, e.g., taking the pets to the veterinarian, feeding and caring for the pets, etc. We should form public/private partnerships with these animal rescue groups to create pet-friendly homeless shelters. Q: Do you support the “housing first” model which places the homeless into permanent housing (vs. temporary shelters) as a first step toward stabilizing their lives? 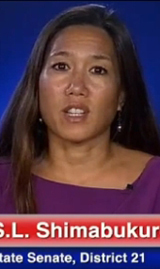 Q: Can you give examples of how your current political campaign has/will model island values of aloha and kuleana? Maile: One of my top priorities if re-elected is to renew efforts to place a moratorium on the sale and transfer of ceded and public land. I believe that all public lands should be treated like a trust, similar to how DHHL handles their lands. Long-term leases are fine, but the state should not be allowed to sell/transfer our most precious and finite resource – land. 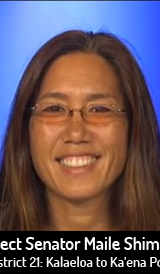 Q: Would you/have you sent your children to Hawai‘i’s public or public charter schools? Why or why not? 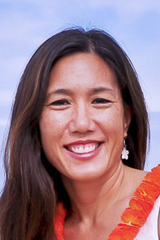 Maile: Yes – I am a firm believer in charter schools, and I also believe that children should be exposed to a variety of other children from different socio-economic backgrounds. Q: What actions have you taken to help address the needs of the poor or homeless in your community? Maile: I have authored measures which improve the general assistance program by allowing the disabled to claim both physical and mental disabilities when applying, and to claim good cause for failing to pursue medical treatment. I also authored a measure allowing people 3 months to find a rental after being approved for the state’s rent supplement program. Q: What actions have you taken in your home or office to conserve energy and/or cut greenhouse gas emissions? 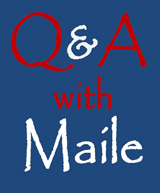 Maile: I live with my parents, who have photo-voltaic panels on their roof and a solar water heater. They also recycle and compost. Q: What locally grown products or foods have you purchased in the last month? Maile: I participate in MA’O Organic Farm’s CSA program, and try to shop at the Wai`anae Farmer’s Market at least once a month.